Michigan state is hurting and its failings can be traced to one party rule at the hands of Democrats and the unions (which are likely synonymous). 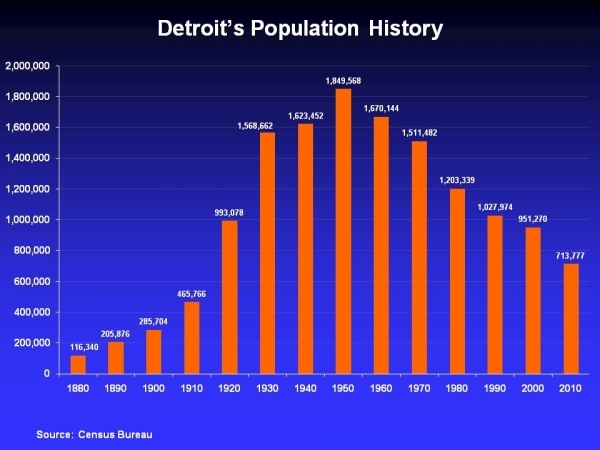 Detroit is now bankrupt, corrupt, and the most dangerous city in America, and residents continue to flee. As Detroit was the engine (pun intended) of Michigan’s economy, it has affected the entire state. Here’s hoping Michiganders don’t get sick or injured, because Obamacare is going to add to Michigan’s woes. For one thing, Obamacare will hurt Michigan’s businesses, in an economy that isn’t exactly thriving. Let’s look at Stryker Corp in Kalamazoo. The device tax will cost them $100 million this year, and that money has to come from somewhere. They have had to slash their research & development budget which, in turn, means losing 1,000 workers. Other employers will be reducing hours and likewise cutting back, and Michigan can’t afford to lose income and jobs. Obamacare also hurts medical centers. Medicare is already a huge money pit, and Medicaid expansion will be unsustainable. A doctor from the Henry Ford Hospital said that "I've heard that our hospital loses more than 70 cents for every dollar we spend caring for Medicaid patients," she said. "It only seems to get worse, not better." It is coming down to a choice between shutting their doors completely or turning away Medicaid patients. A Michigan surgeon said that Obamacare moves doctors away “from humanity-based health care and more towards the patient as a commodity. This was not the way my father practiced – nor will I.” He said that he is “Winding down to retire early.” Losing doctors and reducing care for those less able to pay hardly seems like a good thing for Michigan. That’s because, no matter how they try to spin it, it’s not a good thing. Michigan is, of course, a highly unionized state, which is compounding the problems. Unions lobbied hard for Obama and other Democrats to win, and a large part of that was because of support for Obamacare. Now even the unions are seeing the writing on the wall. In July, the three largest unions in America sent a letter to Reid and Pelosi demanding changes to Obamacare; changes that never materialized. The letter said that Obamacare will “destroy the foundation of the 40 hour work week that is the backbone of the American middle class,” and “destroys the very health and wellbeing of our members along with millions of other hardworking Americans.” If Obamacare means fewer hours and destroyed wellbeing of union members, Michigan will be hit hard. Obamacare has come to Michigan, and it’s not looking good. We’re in for higher unemployment, lower income, and a reduction in the quality healthcare. This can only make things worse for a struggling state and the residents who stay.